As the honeybee works, distributing flower pollen from bloom to bloom, it collects some of the pollen and takes it back to the hive. In the hive, hundreds of honeybees process the pollen into sweet, liquid honey and store it in honeycomb cells. For some, honey is a sweet treat for toast or for sweetening herbal tea, but others see honey as a treatment to speed the healing of wounds. The use of honey is part of holistic medicine that seeks natural ways to improve health. Talk to your doctor before using honey to heal wounds. The "Journal of ApiProduct and ApiMedical Science" reports that honey was a popular wound dressing in Ancient Egypt, based upon the translation of The Ebers Papyrus, an ancient document, dating to 1550 B.C. The papyrus details 147 ways to apply honey to the body. 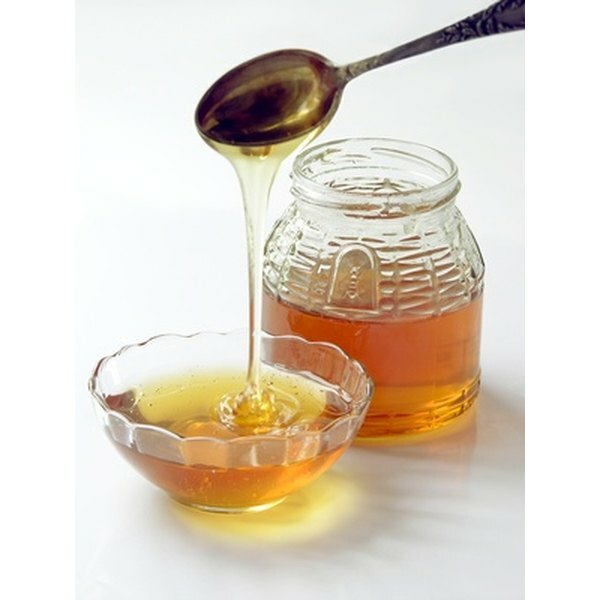 Medicinal honey uses included the treatment of burns, sores and the application of honey as a topical dressing to speed healing from some surgeries, including circumcision. Honey contains a concentrated solution of sugar that restricts the growth of microorganisms, according to the New Zealand Dermatological Society, or NZDS. When honey makes contact with the substances secreted from a wound, it may produce a type of hydrogen peroxide that prevents bacterial growth, notes NZDS. This antibacterial action may help speed the healing of minor wounds. The application of honey as a wound dressing depends upon the amount of drainage present. NZDS explains that wounds with a lot of drainage will require more honey than wounds with little or no drainage. Applying the sticky liquid can be a messy chore, so NZDS suggests putting the honey directly on sterile gauze pad and then placing the pad on the wound. Pretreated bandages that contain honey are available at health food stores. A doctor should examine the wound before applying a honey treatment. Pressure ulcers, leg ulcers, diabetic sores and minor burns may heal more quickly with the application of honey as a wound dressing, according to NZDS. Honey may also be beneficial in the treatment of minor cuts, but do not treat wounds with honey unless directed to do so by a medical professional. Those who are allergic to airborne pollens may experience an allergic reaction from using honey, according to Drugs.com. Because the bee gathers pollen to use in the production of its honey, some of its allergic constituents may remain in the honey, triggering a reaction. Drugs.com also warns that honey made from the pollen of poisonous flowers may be poisonous, so it is important to know where your honey comes from. In addition, heating honey may destroy its antibacterial activity.